When a childs birthday rolls around every parent's goal is to create the best birthday party ever. When planning your child's birthday it is important to plan a party that will keep the children busy. A party loaded with fun things to do will make your child, guests and mom happy. Younger children, toddlers to about twelve years of age need a different venue of party ideas. Children tend to become easily bored, so plan a mixture of activities geared to their age range. A water slide is an example that pulls in the interest of youngsters. Mom's plan your parties outside. This is best because it allows the children to run and be rowdy without tearing up the inside of your home. Outside parties allow room to move, and children and their parents do not have to worry about breaking items. It is a sure bet that if you have a well-planned party, it will be hit with your child and you. 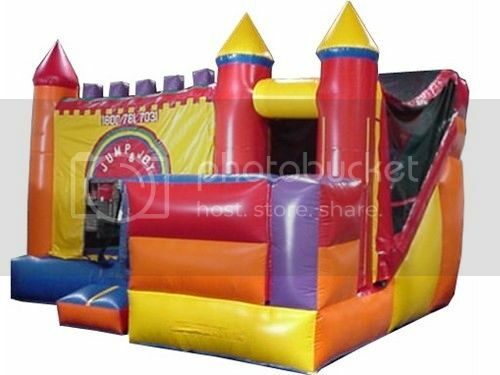 You are wise to obtain a few amazing focal points of your party, such as various jumper rentals, bounce houses, or water slides at one of the lowest priced party supply places on the market. Children like to bounce and jump and this helps to place energy where it needs placing. Your child's birthday party is not the only gatherings that can use imaginative and useful tools such as bounce houses and jumpers. Any other planned event where there are going to be young children, can use some of the following items. These items trigger an enthusiasm and excitement and are sure to keep youngsters busy. These tools allow your and your adult guests time to gather and talk without having to worry about what the kids are doing. Moms and dads can consider theme tools. If your little fellow is all about Batman, Spiderman or likes dressing up like a pirate your party can focus on what the child loves at the time. Your little princess might be all about Sesame Street, Dora the Explorer or Finding Nemo. These are just a few themes that are popular with children. Youngsters, sometimes up to the age of twelve like to use their imagination. A themed party always fits into young imaginations. If your little man is all about pirates, plan a theme party with everything decorated with a pirate venue. Plan to purchase some chocolate covered coins, play swords, pirate plates, cups, and tablecloths. Order a pirate cake and a Pirates of Caribbean bounce house. A pirate piñata is always loads of fun. Your little fellow can ask if their guests can dress up like a pirate, wear a pirate hat or wear a pirate eye patch. All little princesses enjoy dressing up. If your princess is into dressing up, plan to buy some little girl's makeup kits to give as a treat. You can find these little play makeup kits not more than one dollar at any dollar store. Princess tablecloth and accessories plus a princess cake and a princess castle bounce house will make your princess' party a sure success. Her guests can come dressed up like mom or a princess. Other unusual party ideas to make your little one happy are a cotton candy machine, or a snow cone machine. Pop popcorn machines will make one big batch of popcorn for the day. Flavor your batch of popcorn with the child's favorite seasoning. A large hot dog machines will keep hot dogs well grilled and hot. This is an easy food choice for children and moms. In addition, for variety, think about using plain inflatable slides, inflatable water slides are popular, or an obstacle course may fit into your party plans. It is fun for the child and you to plan a wonderful party, and your child will be the most popular kid around. You will be the 'in' mom who knows how to keep children active and interested. Be the mom in the know. Kristen Wilderbrand manages the event planning for the Discovery Center in Orange County. She likes to watch the children learn and grow. Personally, we found it better, financially, to buy our own inflatable waterslide. It has been a huge hit the past 4 years, for both parties and neighborhood gatherings. Last year, we rented a sno cone machine, and that was a hit, too. Thanks for the tips. I'm def doing this for my sons 3 rd birthday! Imagine a bunch of toddlers jumping around all afternoon hyped up on cake and ice cream - perfection! There's nothing like a bouncy castle to keep kiddos happy and entertained for hours! And you would want them to spend all that energy from all that cake and ice-cream! I think my daughter is planning a bounce house for my grandson's birthday party - it will keep the kids entertained and they will spend some energy and keep them very busy. A great post -- I've often thought about renting a bounce house for our son's birthday but never did --- this post makes me want to do if for his next birthday. Great post -- thanks!